Great Winter Walk: Rough-leg, Plus! 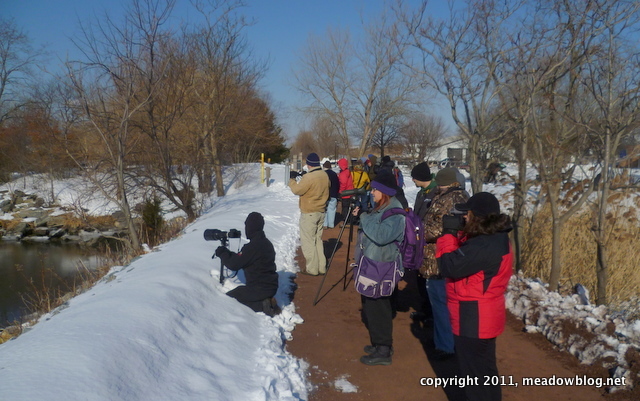 A big thank you to the two dozen hearty souls who braved the single-digit temps and chilly winds for today's bird walk — which featured a (distant) Rough-leg, a Bald Eagle (early and late) and great looks at a Gray Ghost and plenty of White-crowned Sparrows. We will post a full list in the next couple of days. A thank you to Bergen Audubon for leading the walk with the Meadowlands Commission — and to Kevin Browne and Rob Fanning for bringing the extra scopes and eagle eyes. Kevin reported three Long-tailed Ducks "tucked against the rocks with a raft of Canvasbacks on the far side near the towers. There was also an adult Bald Eagle sitting on the ice, and he dove into a bunch of mergansers on the other side of the turnpike. (I saw him dive, and mergansers went scattering everywhere.) There was a Golden-crowned kinglet right where we saw the pintail and canvasback. Also better looks at the 2 kestrels chasing a harrier."